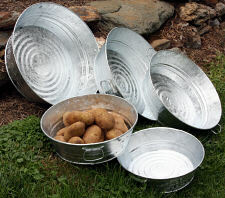 These galvanized wash pans come in 4 different sizes. Use your wash pan to gather your harvest from the garden, as a decor piece in your home, as a centerpiece at parties and events. A wash pan can also be used for organizing and storage in the home and/or office. Or use it as a wash pan.